While Anne-Marie is in Saudi Arabia I am guest blogging on Soap Queen – thanks for stopping by! I always enjoy Anne-Marie’s cooking adventures and thought I’d share one of my favorite recipes with you. Recently, thanks to my co-worker Norm, I have fallen in love with making pasta. Norm lent me his hand crank pasta machine in the fall and I rolled away on it for months. 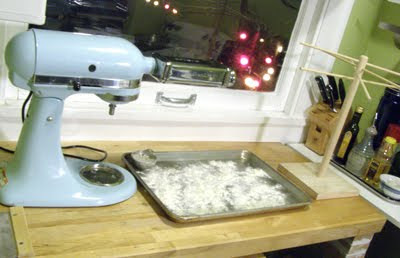 And then for Christmas, I got the pasta attachment for my stand mixer as well as some other cool accessories. My ‘cranking arm’ has been much happier ever since. If you aren’t lucky enough to have the fun kitchen gadgets I have – don’t worry. You can make pasta with nothing more than a rolling pin, a sharp knife, and some elbow grease. 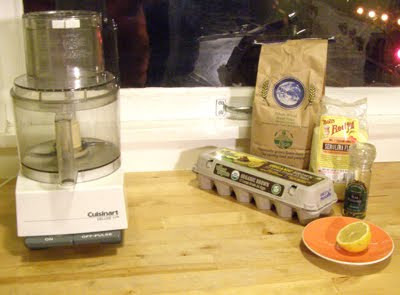 Place all ingredients in the bowl of a food processor and pulse until it starts to come together into a ball. Sprinkle in a little extra water if it seems too dry. Gather the dough on a floured surface and knead it a little to incorporate any of the stray bits. Form it into a nice ball and place in the fridge for at least an hour. You could even leave it in the fridge over night and conquer the rest of the pasta the next day (I’ve definitely done that before). Here’s my set-up for rolling the pasta. There’s my blue mixer with the pasta attachment hanging off the front, a floured tray for laying the pasta on as I work with it, and a pasta drying rack. Divide the dough into 4 pieces. Place the pasta machine on the widest setting and pass the pasta through. Fold it over and pass it through a few more times until it’s smooth and pliable. Then start to turn down the thickness and pass the pasta sheets through until it’s as thin as you like. If your pasta feels a little sticky at this point, just brush some flour on it before passing it through the rollers. Once your have all of your pasta rolled to the thickness you like, it’s time to cut! I have a spaghetti cutting attachment that I used on this batch. Once your pasta is cut you can immediately cook it and eat it – just make sure you don’t over cook it. Fresh pasta doesn’t take long! If you want to store it place it in a plastic container with a seal top using LOTS of flour between the layers. You want it swimming in flour to make sure it doesn’t stick together. Although it will keep for a week or two, I recommended eating it within a few days. Because otherwise, what’s the point of making fresh pasta if it isn’t fresh when you eat it? Next Post: Soapylove tutorial: Rainbow Carnations! I find that white rice flour with my fresh pasta keeps it from sticking together better than regular flour and doesn't get gummy. Just thought I pass that along! I need the pasta maker attachment! This looks so good. What kind of sauce did you use with this? Yum! Teresa – You will be shocked at how much faster it is with the pasta attachment. Obviously, I highly recommend it. I've been wanting to buy the pasta making attachment for my Kitchenaid mixer, and I think you've pushed me further in that direction! Thanks, Amber, for the pictorial tutorial…I love the step-by-step! A-M – What are you doing still up? Go to bed Missy! Lori – That's the fun of making your own pasta, trying out different flavors. But it's best not to get too crazy. Chipotle Chocolate, anyone? 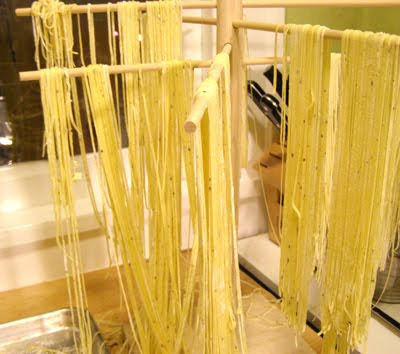 Lynn – Yes, the pasta drying rack was a Xmas gift and it's awesome. It comes apart and stores flat – which is essential in my little kitchen. Erin – Can't wait to see what you come up with! OMG! I have always wanted to do this! Thank you for sharing! I've been making pasta for years. My recipe is a bit different but homemade pasta is sooo good. Hubby makes the sauce and we feast! I love the pasta dryer rack. I end up laying mine all over the kitchen (LOL). This looks much more efficient and less messy. I'll put one on my "I want for a gift" list. wow – it looks so cool amber! fresh pasta drying on wooden sticks (probably a fancy "pasta dryer"). i love lemon & pepper. so simple… i bet it's delicious. i think nearly all of us soapmaker's also love to either cook or bake. thanks for sharing the recipe & details! Love love love this so much! I am totally making pasta with your hand-me-down pasta maker when I get home.